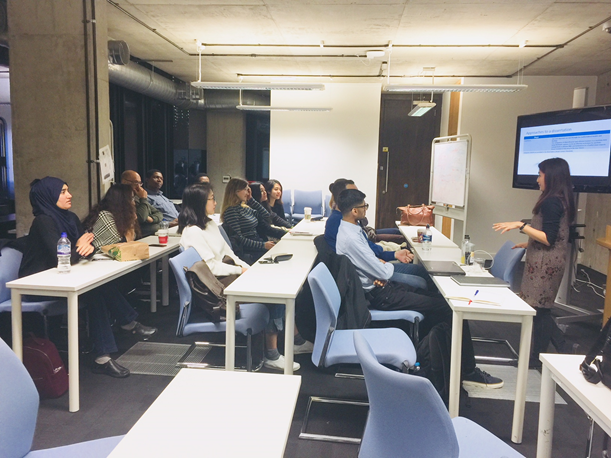 On 14th November 2017, Tanyada Mongkol, (MSc Risk Management graduate) was invited back to GCU London to present a seminar to current students about her experience on writing a successful dissertation whilst giving hints and tips on what to do, and what not to do. As a student, Tanyada achieved a distinction in her dissertation focused on ‘the evaluation of a real option approach from the perspective of portfolio diversification in pharmaceutical research and development’ so her advice was greatly appreciated by her peers. “It was quite interesting to hear how one of our fellow MSc Risk Management classmates was able to combine the learning from one of our key modules, Risk Financing, with her professional experience in pharmaceutical industry to produce original academic work. Tanyada shared the obstacles, challenges and doubts she was faced with during her dissertation work and those were especially beneficial to us who are currently working on our research proposals in preparation for the dissertation next term. It was particularly useful to find out about the dissertation writing process and how it is important to work closely with our supervisor to get timely feedback and achieve the best results.